Scientists at the University of Veterinary Medicine Vienna have been working on developing new varieties of chamomile that can be cultivated as a medicinal plant. The researchers have been trying to identify varieties that will bloom longer and make its cultivation easier. Their methods and results have recently been published in the scientific press. Chamomile is a medicinal plant used mainly in the treatment of stomach and intestinal diseases, including the field of veterinary medicine. Agricultural scientist Bettina Fähnrich from the Institute of Animal Nutrition and Functional Plant Compounds has been focusing on the genetics of chamomile (Matricaria recutita). She has been looking for chamomile varieties with a triploid (threefold) set of chromosomes instead of the natural diploid (double) set. Plants with the triploid form produce blooms that last longer and have a longer harvesting period. An additional advantage of a triploid variety of chamomile is that most of the seeds produced would be sterile. This slows down the reproductive cycle so that the plant would not germinate in the following season, when the farmer wants to grow another crop in the field. This means less chamomile has to be removed as a weed in subsequent years. But finding such a triploid variety did not turn out to be an easy task. Many plants change their number of chromosomes spontaneously and naturally – it’s an evolutionary process that enables them to adapt to external circumstances. But not so with chamomile. “It is very difficult to do research on chamomile because this species is rather conservative, in genetic terms. That means that it doesn’t change its genetics easily. Other plants are much more flexible,” Fähnrich explains. Producing triploid chromosome sets has become common practice when cultivating ornamental plants such as marigolds and begonias, but it proved harder in chamomile. In the hope of finding one of these elusive triploid chamomiles, the scientists searched for spontaneous triploids in different varieties of the plant. Since the number of sets of chromosomes in plants can vary, the researchers hoped to find a triploid variety among them. However, when they screened naturally occurring diploid and artificially generated tetraploids (with fourfold chromosome sets), what they found in the tetraploids were frequent deviations from the expected set of chromosomes. It appears that the artificially mutated genomes in the tetraploids have a less stable genome than the natural forms; but even so, they did not produce any triploid varieties. “If one wants to propagate plants successfully, it is vital to know how they reproduce,” says Fähnrich. To find out, the chamomile geneticist analysed over 300 different varieties of chamomile plants from six different breeds, focusing on their capacity for fertilization. She crossed all these cultivars in both parental directions. The fertility of the pollen produced by the subsequent generation diminished significantly. The next step was to identify which crosses produced offspring that were almost infertile in pollen. These varieties would be the most promising for breeding, because they could be used as suitable mother lines for targeted plant crossing. Generally, there are plants that can only fertilize themselves, and then there are plants that only fertilize others. Some plants can do both. 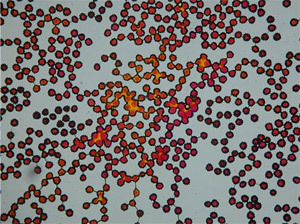 Determining the extent of these different types of fertilization was one of Fähnrich’s research aims. For breeding, the researchers are looking for varieties that cannot do self-fertilisation, because these types could easily be crossed with specific father plants. Herbal medicine has become increasingly important in recent years, and including the field of Veterinary Medicine.